The following web pages document a recent cycling trip through the English countryside. Our route starts at London's Heathrow Airport, and traverses through the following towns and cities: Oxford, Cirencester, Bath, Glastonbury, and Salisbury. Not all of this trip encompasses the Cotswolds, however, we decided to incorporate the Costwolds name into these web pages, as a "catch" point. The Characters: Kevin Rodger and Tom Jolliffe both cycle actively around their home base of London, Ontario, Canada. Both "gentlemen" are members of the London Cycle Club. Kevin is the young fellow, born in 1957, while Tom is about seven years older (I think). Since teaming up last year for a cycle trip from Frankfurt to Munich along the infamous Romantische Strasse, we have been very resourceful in planning cycling vacations, probably adding a lot of consternation to our wives' lives in the process. 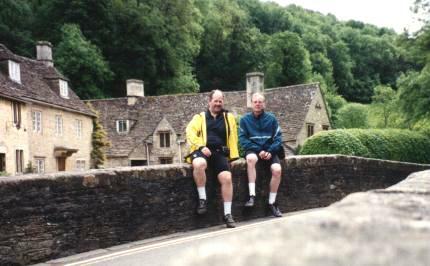 Originally, Tom and I had planned to cycle through the Canadian Rockies from Jasper to Banff at the end of June 2000. However, a scheduling conflict precluded that trip (which we eventually took along with another campanion in 2002). Tom and I quickly sought an alternate destination that would fit into my vacation period at the end of May (it snows in the Rockies in May, that is why we didn't go there during this vacation period). We didn't have much time, as we still had to obtain airline tickets for Tom. We finally settled on England because of the availability of flights, and because of an itinerary we had seen in the book "Europe by Bike," by Karen and Terry Whitehill. We would arrive in England on May 27 and depart June 5. This allowed for a day to travel to Oxford, seven days of cycling, and a day to see a few sights in London. As you can see by our web pages, things changed, and flexibility was a must. We altered our schedule somewhat so we could further enjoy some sightseeing. As a result, most of our cycling ended in Salisbury. We did, however have the opportunity to cycle directly into Heathrow Airport, where we left our bikes at left luggage for two days while we gallivanted around London. I must give credit to my riding partner, Tom Jolliffe for providing most of the written input into these web pages. Tom, even though he is much, much older than I am, seems to have an impecable memory. The detail he provided was invaluable in setting up this web page. Maps: I thought it might be appropriate to mention my thoughts about maps. Prior to leaving our hometown of London, Canada, Tom and I obtained the most detailed map we could find - a 1:250,000 scale map of south west England by Collins. We were able to find this map at the bookshop located upstairs in Novaks, an outdoor outfitter located in downtown London (Canada). This is the only map we used for the entire trip. While it proved satisfactory, I highly recommend abiding by the Whitehall's suggestion in their book: "If you haven't purchased a map with good detail up to now, do it before you leave Bath. Even a 1:50,000 map won't be overkill for this stretch of cycling. Your pence will be well spent." We actually tried to purchase the Ordnance Survey maps while in England, but every time, without exception, the map we required was always out of stock. By going to this web site, you can pre-order any maps you might require.